Do I Need to Clean the Underside Deck of My Lawn Mower? 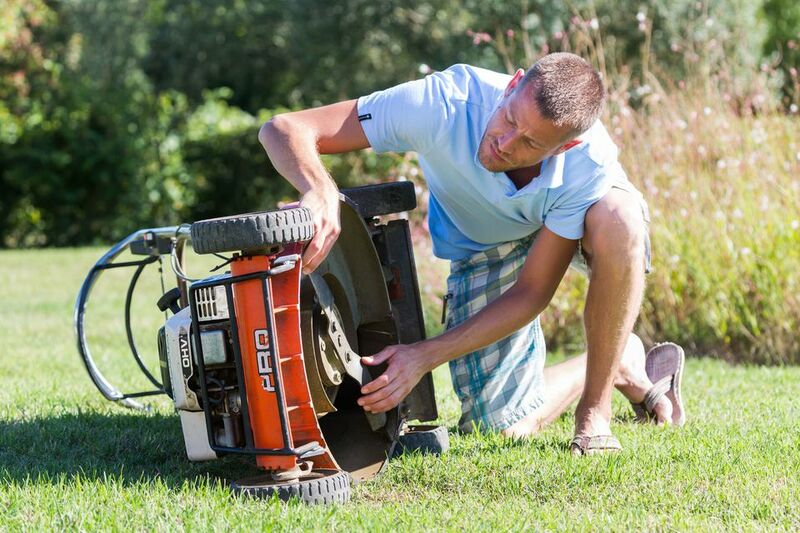 It's no surprise that there are many opinions on how often a lawn mower should be cleaned. This is largely a matter of personal preference—just as some people sweep and wash a kitchen floor daily, others may only do it weekly, or even just monthly. The same holds true for outdoor lawn and garden tools. Some people with a robust neatness gene may prefer to clean lawn mowers and other garden tools thoroughly after every use, while others find no need to be quite so meticulous. Is it necessary to clean the mower deck? If so, why? If it is necessary, how often should I clean the mower deck? And how exactly should I do it? A related but different question has to do with what TLC you should give the lawn mower when you are ready to put it away for another year. The reason for cleaning the deck—the enclosed housing beneath the mower, where the blade spins— has nothing to do with being neat (unless you are the type who takes pride on showing guests your power equipment). Cleaning will actually help lawn mower performance by allowing the blades of grass to stand fully upright as the blade spins to trim them. A lawn mower deck heavily encrusted with dried grass clippings may deflect the grass blades so they can't be cut efficienty, and in worse case scenarios, the dried grass buildup can even hinder the rotation of the blade itself. Keeping the bottom deck clean also helps minimize the spread of lawn diseases. Remember, when you cut blades of grass, you are essentially opening up wounds that make the grass susceptible to problems such as fungal disease, which may be lurking in the grass buildup on the bottom of the mower. There is no rule about how often to clean your mower deck, but it really should be done at least twice each mowing season. You may need to do it more often if you're forced to mow very long grass, or if you have to mow it while it is wet. It's also wise to clean the deck of your mower at the end of the season, before putting the mower away for the winter. It's unpleasant to leave grasses to rot and mold on the bottom of the mower over winter, especially if you are storing your mower in an attached garage or basement. Left to harden over winter, your spring cleaning chores will be all the harder. Empty the gas tank (or run the mower until the tank is empty), then disconnect the spark plug wire. Stand the mower up on its side. Take a garden hose and spray the deck at full blast. This will loosen some of the dirt and caked-on grass clippings. Scrub off the rest of the soil, using a brush, soap and hot water. Rinse, then dry the metal deck of your mower. Tip: To reduce future incidences of grass clippings sticking to the lawn mower's underside, lightly spray some vegetable oil onto the deck after cleaning it. When the mowing season is over in the fall, empty the gas tank by allowing the lawn mower to run until its gas tank is empty. Leave the lawn mower's tank empty until spring comes, if possible. When old gas lies around in the lawn mower all winter, it becomes gummy and may foul the engine. If you must leave the tank full of gas, add a can of fuel stabilizer to the mower tank, then run the engine for a few minutes to distribute the stabilizer through the fuel lines and engine cylinder before putting the mower away. After dealing with the gas, drain the oil crankcase and refill it with fresh oil. These steps should make your lawn mower ready to go when you pull it out of the garage or shed next spring. But if you do end up having trouble starting your lawn mower, it may be because you need to tune up your machine, which is a fairly easy DIY task. How Do I Get My Lawn Mower Ready for Winter? Why Does Longer Grass Help Support a Healthier, More Attractive Lawn?